Kansai is a cultural hot spot of Japan, and it’s no wonder: the region offers its own gastronomic delights, rowdy pop star grandmas and super delicious green tea. But if you’re arriving in Kansai via plane, specifically through the Kansai International Airport, you have an important first step… actually getting into Kansai proper. And what better starting point than the gorgeous, classical city of Kyoto? Worry not. There’s a direct express train, adorably named “Haruka” (which means "faraway"), that will deliver you straight to the former capital from the airport itself. Brilliant! 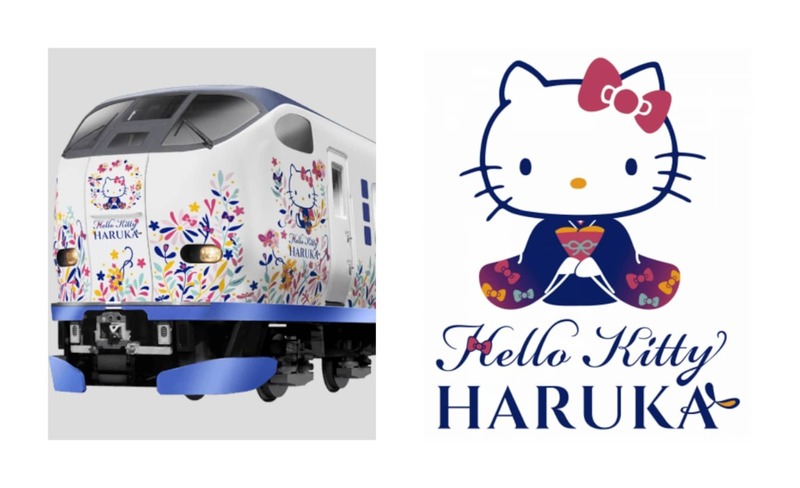 And as of this January, there’s even more incentive to take the Haruka train: the people at JR West are collaborating with Hello Kitty to bring you a super cute dose of Japanese hospitality while you travel! ▼ The main artwork for the collaboration, showing Kitty in a stunning kimono. Kitty herself is no stranger to trains; she even has her own shinkansen, after all. In keeping with the classical Japanese beauty of Kyoto, on the Haruka trains she’ll be clad in a beautiful kimono and surrounded by ornate flower patterns. ▼ It’s not just the outside—Kitty’s pretty patterns continue inside the cabins. 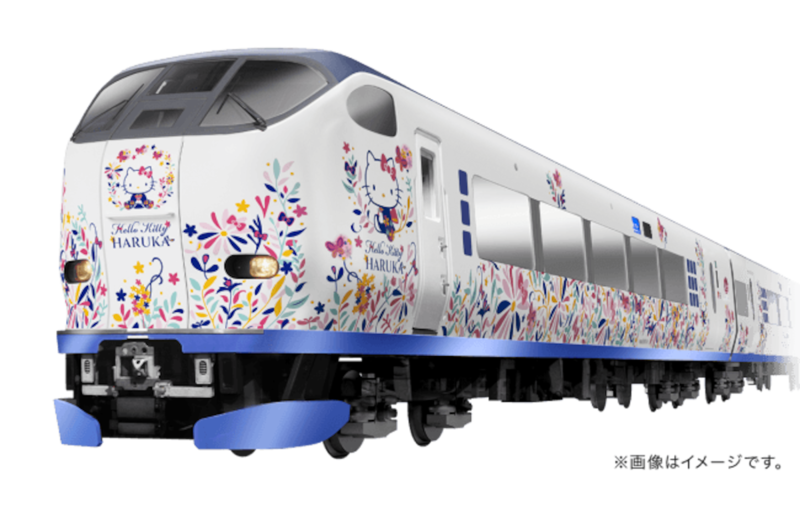 The train will go into service from January 29, 2019, and is limited to just one of the Haruka Direct Express Trains, which will be driven on a different schedule each day (and not every day). This makes it even more of a special experience if you get to board! The design was created from the inspiration of Japanese hospitality, hence the welcoming colors and beautiful kimono design. The natural butterfly and flower patterns, combined with Kitty’s timeless image, combine to create a “Japanese Modern” aesthetic. ▼ You can enjoy the designs from right next to the doors as well. This is only the first stage in the Haruka collaboration project; a second and even third stage are currently in planning. But until those are revealed, you can enjoy the first stage to the maximum if you happen to be in Kansai International Airport during the project’s Welcome Event, which takes place on February 5, 2019. Tickets sold will feature art from the campaign, and an event will be held from 1:00 p.m. to 3:00 p.m., where you can meet not only Kitty herself but also Mr. Ryuho Sasaoka, from the Mishoryu-Sasaoka School of Ikebana. Mr. Sasaoka will demonstrate how to welcome a guest in a traditionally Japanese manner, holding true to the collaboration’s theme. Don’t worry if your Kansai-bound flight is taking you through Osaka’s airport, though; you might still catch a glimpse of a different, but still totally adorable, mascot character on your trip through. Read the original article from SoraNews24 via the link below! Hello Kitty Coming to Converse Sneakers! Headquartered in Tokyo, Japan, SoraNews24 is a bilingual news blog. Since our humble launch in 2008 we’ve built a massive fan base by reporting the interesting, strange and random. Saying 'Sayonara' to Japan? It'll Cost Ya!